Financing a business using credit cards can be a gamble, but there are many entrepreneurs who have used this method and went on to build successful businesses. Anyone considering this method of business financing should be aware of all the pros and cons before proceeding. Many people who are trying to start a business will find financing one of their major obstacles. Banks and other lenders do not always look favourably upon new business ideas, especially where there is an element of risk involved. People who cannot place an amount of their own funds into a new business may find that financing through the traditional lenders is not a viable option. Financing a business using credit cards may be risky but can pay off in the long run. While there are some advantages to using credit cards over traditional business financing methods there are also some disadvantages. Interest charges and late payment penalties is one of the major disadvantages. A few missed payments can soon mount up meaning interest payable on both the late payments and late payment charges. These late payments can result in bad credit references that many have an impact on future borrowing. Credit cards are frequently used as part of business financing with the most common use being short term business purchases. Small start-up businesses often used credit cards for their working capital although this is not often recommended due to the high levels of interest. The best option is to pay off the balance before the interest free term expires, making this a cost effective financing method. Credit cards will be vital for invoicing and especially for internet purchasing and sales. Start-ups that are considering using the credit card financing route should research the best credit deals available. Checking out the rates between business and personal credit cards should be a priority. There are business cards that come with extended introductory interest free periods. Extended interest free periods are vital if using the credit card to purchase business assets. Look for the special 12 month or longer zero percent interest offers that are available through certain lenders. Some business credit cards will come with added features such as bonuses and insurance against misuse. Extra bonuses on business credit cards can include double cashback on items such as fuel purchases on the card or on a range of other purchases. Free insurance on the business cards can include protection against employee misuse, purchase protection, and free travel insurance. There will usually be fees, terms, and conditions applied to these credit card extras, and reading the contract before signing is advisable. Always make low interest rates a priority against any bonus or loyalty schemes. Many businesses make the mistake of using multiple credit cards to help with financing. 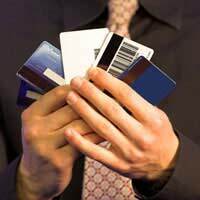 There are some dangers to having multiple credit cards including the obvious overspending. Having multiple credit cards will often send out a bad signal to lenders who will view excessive credit cards as irresponsible borrowing. Multiple credit cards also mean multiple charges and fees for missed payments, and of course multiple statements and paperwork. Having three or more credit cards will usually bring more negatives than positives in the long run. Financing a business using credit cards can be simple and hassle free if the cards are used sensibly. Careful monitoring of spending is vital, especially if employees are permitted to use the business credit cards. Start-up businesses should always research all financing options to find the most cost effective financing method. The success or failure of a business can often depend on choosing the right financing.